I ‘ve been feeling like denim jacket for a while…..but not 100% yet. I ‘ve been wearing them at home for at least a couple of years now, checking if that short length seems familiar again. I occasionally started wearing them outside last year…and feel like wearing them more often this year. 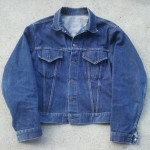 LEVI’S 1st edition jacket, late 40s~early 50s. I personally prefer older ones, yet this last version of the 1st edition fits me better thanks to updated patterns. To me, denim jacket means LEVI’S 557. I remember I was so crazy about this jacket when I was low-teen. Whenever I feel that 557 is a little too short, then I go for 70505. 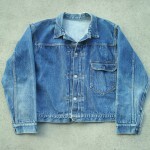 When I wa a kid, I was so curious whenever I saw older denim jackets in the photos. They looked different compare to then-current model(that was early 70s). They looked darker, with more streaks. It took me some more years to find out that they did’nt make the stuff as they used to do. 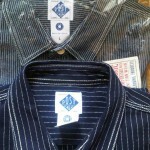 I really admire LEVI’S 557 design. 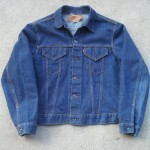 As you may know, older denim western jackets always have pleats in their fronts (as on 1st~2nd edition jacket) which allows some extra movements. LEVI’S has been making this pleated jacket to match their pants (501s) for a long time already and so did the other companies. But then LEE came up with their whole new design (101-J) without front pleats in the late 40s, LEVI’S followed the same….but almost 10 years later…thus 557’s debut. Wrangler and some other companies still retained front pleats well into the late 60s though. 557 seems so reasonable to me, in terms of perfect mathcing jacket for their existing trousers – well, to be more precise – for their new trousers (551XX=forerunner of 505) which utilized pre-shrunk denim fabric. LEVI’S still offered shrink-to-fit denim jacket and pants untill 50s, back when all the other denim products are already using pre-shrunk denim fabrics since its development in the mid 30s. Now they could offer replacement matched set (557 and 551=505) of pre-shrunk denims. So, LEVI’S have really catched on. The whole new jacket seems so natural and organic….as if that jacket design was born together with their signature pants. Of course the designer behind them is totally different….the time they lived is vastly remote, too. I wonder how he or she made it……finally a perfect matching design was born. I believe 5 pocket jean is one of the most primitive existing men’s designs….and I believe what makes jeans separate from all the others is…..skin tight fit or the fit which naturally traces along human body. I believe that is why people come back to them from time to time. 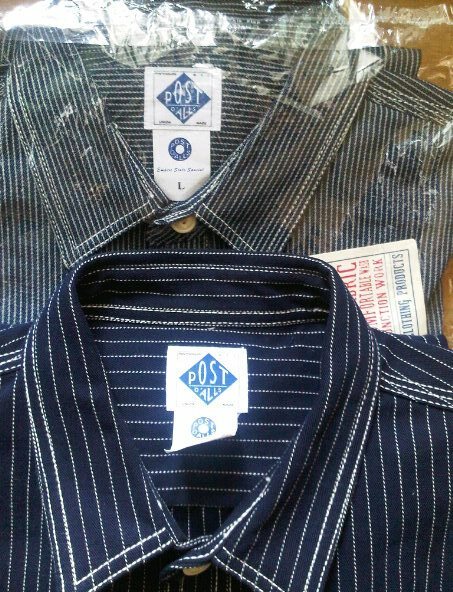 Here’s a photo of fake POST O’ALLS shirt which a customer from Thailand sent it to us to verify its authenticity. I see it is lacking ” Made in U.S.A.”marking on its printed label……and smaller collars, unlikely fabric choice, incorrect buttons and paper tag…. P.S. My V.S.O.P. exhibition at NEPENTHES NY Gallery extends to 6 weeks.